If you’ve waited until the last minute and still haven’t conjured up any treats for the holidays, this is a real quick one to throw together. 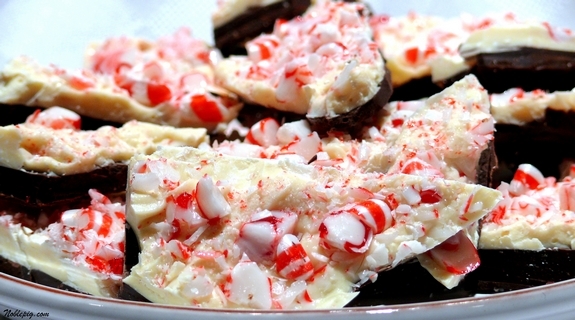 I have loved peppermint bark since I tasted it at Williams-Sonoma many years ago. However, when I found out how easy it is to make, I have been making it homemade ever since. I don’t have much time to chat as I am so busy right now, so here’s the recipe….enjoy. I have also been hiding this from my husband. If he happens to check my blog, the jig is up, he will be on the prowl. Line a 13 x 9 inch pan with foil. Set aside. In top of a double-boiler or in microwave (I used the microwave), melt dark chocolate chips. Spread into prepared pan. Refrigerate until JUST ABOUT set, about 15-20 minutes. The just about part is important as this will help meld your chocolate together. In top of a double boiler or in microwave, melt white chocolate chips. Stir in peppermint extract. Spread on top of dark chocolate. 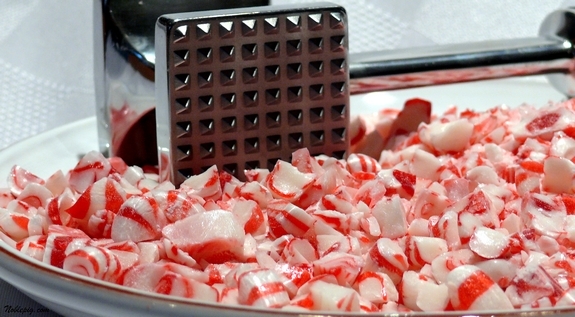 Sprinkle with crushed peppermint candies. Refrigerate until set, about an hour. Remove from pan and break into pieces. Store at room temperature. You won’t stop at just one. Wow. You’re right. These are super easy to make. I always think this is the prettiest of all holiday treats! Wow, dark chocolate AND white chocolate … and then peppermint. Awesome recipe, Cathy! 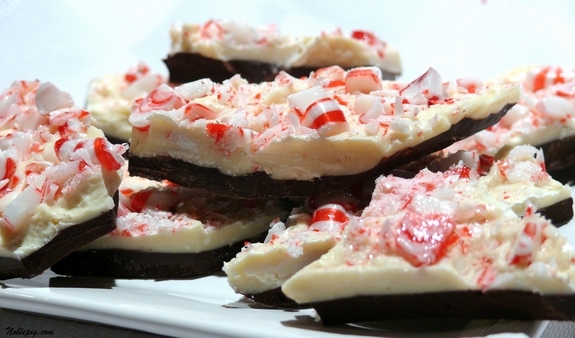 Nice…peppermint bark is a huge favorite in our household. I think I’ll make this for everyone to eat on Christmas day. That stuff just screams out Christmas….look delicious! A sprinkle of just a little bit of sea salt adds a delicious extra touch to these. I make a white chocolate bark and I am tempted to make more…little mice have been munching on my stash. Beautiful, delicious and breath-freshening..who could ask for anything more from a holiday treat? Merry Merry and Happy Happy, Cathy! Ahhhhh! I’m running out of time and want to make everything! Have a wonderful week and holiday! Did you post this year about gift ideas? If so, I missed it. Last year you posted about putting together gifts from items purchased at Marshall’s, TJMaxx, etc… It was fantastic! I just love the colors of this so much, which makes it a really good gift to give. Love this too, it’s one of my faves. I love the double chocolate here. No I didn’t, no time this year. Grumpy gets soooo annoyed with me when I hammer candy canes. lol. This looks delicious Cathy! I love dark chocolate and peppermint! Looks delicious. I have been eating the Ghirardelli squares this week but you may have convinced me to break down and make some of the real stuff with big texture and pretty homemade appeal. Thank you,, this looks wonderful! Awesome, I love bark. It looks lovely, too. chocolate on top of chocolate and infused with peppermint is an unbeatable combination, and i’ll stand by that statement forever. Ooh, looks great, and easy! Yum!! Well, we are baking again tomorrow and I do have all these things on hand…..sounds like a plan to me! So festive and delicious! Love it! Delicious and festive! This is a great holiday treat. Just right for the holidays! So quick and easy. Thanks. You know….I have never eaten peppermint bark. I need to try this! I’ve never been a fan of the chocolate peppermint but this looks realllllllly good! I might have to try this! What a lovely bark! So festive and simple – a perfect combination in my mind =D. I have been wanting to make this for days and I always run iout of time. I’m hoping I get a chance tomorrow–but it’s slim to none! Oooh, I love this stuff and make it every year, until this year. I do dark, milk and white. Then one of my daughters sneaks it all. I hope your Christmas is blessed with love, family and joy. I love it, so easy to whip up. Merry Christmas! I am making this recipe as I type – well – sort of! I made these last year to give as gifts, but the chocolate layers separated. But I couldn’t figure out why. Now I know! Don’t let it set up all the way! Thank you, thank you, thank you! This is wonderful!! I made it on Wednesday and it’s perfect. Very little separated. I only let the dark chocolate set up for about 10 minutes before adding the white. It worked perfectly! Fabulous. I have to add this one to my ever growing cookie tray. Happy holidays to you. Merry Belated Christmas Cathy! I hope you had a wonderful time with your family! Some time ago, I needed to buy a house for my corporation but I didn’t earn enough money and couldn’t order something. Thank heaven my sister adviced to take the home loans from reliable creditors. Thence, I did so and was happy with my credit loan. Can you use almond Bark instead of chips?